Featured on Dr. Oz & Dr. Phil and Winner of the 2012 New Beauty Award! The Tanda Pearl Ionic Teeth Whitening Kit is the quickest, easiest and most effective teeth whitening system on the market. Using revolutionary patented ionic technology, teeth are visibly whiter after just one 5-minute treatment. Perfect for teeth sensitive to whitening, this kit is enamel safe and delivers professional results without the discomfort. The Tanda Pearl contains patented ionic whitening gel to deliver instantaneous, professional whitening results without the side effects and costs. This reusable device is easy to use and effectively kills off bacteria, tartar build up and leaves you feeling fresh and clean. The Pearl uses patented technology to activate the enamel-safe Ionic Whitening Gel. The hydrogen peroxide in the gel actively breaks down stains, with virtually no sensitivity for a clean, professionally whiter smile. The clinically proven technology means you will have 100% certainty that your teeth will be as white as they can be. The Tanda Pearl is the only system around with a double-biting tray to whiten not only the front of the teeth, but the back too, all at the same time. This makes the Tanda Pearl the most effective total-mouth whitening system on the market, with rapid and effective results. Step 1: Squeeze one gel tube evenly into each side of the tray, using a total of 2 gel tubes. Step 2: Activate device and treat for 5 minutes. Step 3: Remove device and rinse your mouth and the tray. Use a toothbrush to quickly and thoroughly clean the mouth-tray. The 5 Day Whitener: Treat for 5 minutes twice a day for 5 days. The 50 Minute Whitener: For immediate results, simply do 10 consecutive treatments totaling 50 minutes. The Pearl uses patented technology to activate the enamel-safe Ionic Whitening Gel. The hydrogen peroxide in the gel actively breaks down stains,with virtually no sensitivity for a clean, professionally whiter smile. How Is The Ionic Whitening Gel Different From Others? The enamel safe Ionic Whitening gel was exclusively developed to work together with the Pearl tray. It is based on a unique formula of safe and effective ingredients that remove dental stains to deliver whiter teeth while killing germs and bacteria on the teeth and gums. The spearmint flavor leaves you with cool, fresh breath. The clinically proven technology and ergonomic design of the Pearl provides fast, effective and safe whitening results in the comfort of your home. You will have 100% certainty that your teeth are as white as they can be with Tanda’s fast and effective, patented technology. The Pearl’s double-biting, hands-free tray treats all of your teeth at once while protecting the gums from irritation. It’s stripless, slipless, dentistless, painless, and will leave your teeth spotless. Tanda are universally renowned as pioneers in modern beauty technology. As the leading brand in home-use energy-based device, Tanda offers the widest range of beauty solutions on the market. All products are clinically tested, safe and designed for easy and convenient use. What are the disadvantages/minuses of this product? Costly for the minimal results given. Review: Super fast whitening better then any strip I used before. 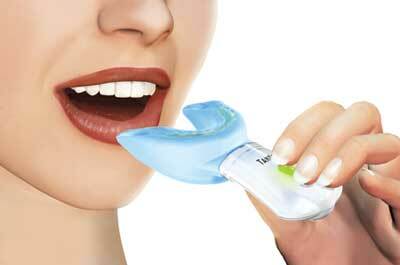 Wonderful way to whiten your teeth when you need them whiter NOW! I would be happy to recommend to friends and family.